Kenneth E. Smothers, 82, of Harrisburg, died Monday, July 9, 2018 at Deaconess Hospital in Evansville, IN. 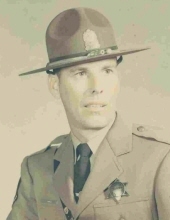 Kenneth was a retired Illinois State Trooper. He was born August 6, 1935 in Harrisburg, IL to Arthur & Anna (Wilkins) Smothers. Kenneth married Dallas Bean on May 25, 2006 at Morganfield, KY. Surviving are his wife, Dallas Smothers of Harrisburg; daughter, Cynthia Smothers & Marc Satterfield of Harrisburg; son, David Alan Smothers of Harrisburg; daughter and son-in-law, Kendra & Troy Hafford of Atlanta, GA; step-son, Dakota Elam of Harrisburg; grandchildren, Steven E. & Ashleigh Smothers, Jr., Michael & Courtney Smothers, Bryan & Danielle Smothers, Wes Leach and fiancé, Chelle Karabec, Angela & Bennie Webb, Shane & Jana Jones, Billie Jo Smothers, Bobbie Jo Smothers, McKenzie Hafford, Mitchell Hafford, Marshall & Sierra Hafford; great grandchildren, Kinzleigh, Maddux, Madison, Trenton, Hayden, Gabriel, Chelsey and fiancée, Jordan, Lexi, Andrew, Aaliyah, Adrian, and Annie; and two great-great grandchildren, Kasen and Kade; brother and sister-in-law, Donald & Ann Smothers of Roanoke, IN; several nieces and nephews, and his beloved cat, Gus. He is preceded in death by his parents; son, Steven E. Smothers; brother, Bob Smothers; and sister, Barbara Waddell. Funeral services will be 11:00 a.m. Friday, July 13, 2018 at J.M. Weirauch Funeral Home in Harrisburg, IL with Pastor Jimmy Williams officiating. Visitation will be Friday at J.M. Weirauch Funeral Home from 9:00 a.m. until 11:00 a.m. Interment will be at Sunset Gardens Cemetery in Harrisburg. In lieu of flowers, memorial donations may be made to Harrisburg F.O.P. # 152, Shop With A Cop, 1 N Main St # 2, Harrisburg, IL 62946; envelopes will be available at the funeral home. To send flowers or a remembrance gift to the family of Kenneth Smothers, please visit our Tribute Store. "Email Address" would like to share the life celebration of Kenneth Smothers. Click on the "link" to go to share a favorite memory or leave a condolence message for the family.